The one eyed garden gnome and other scenes. I feel as old as dirt now but that’s okay because I really like dirt. I’ve been spending all of my free time playing in it. This has been an unusually cold spring and is turning out to be a ridiculously cold wet summer. I’ve been constructing a spiral garden. 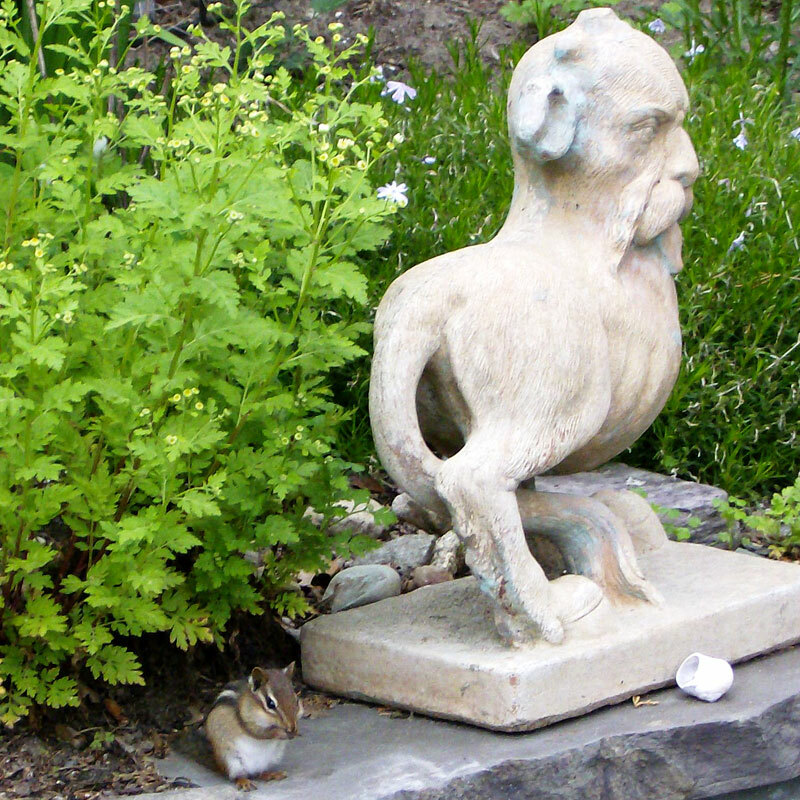 Stone creatures meet live critters for fun and mischief. 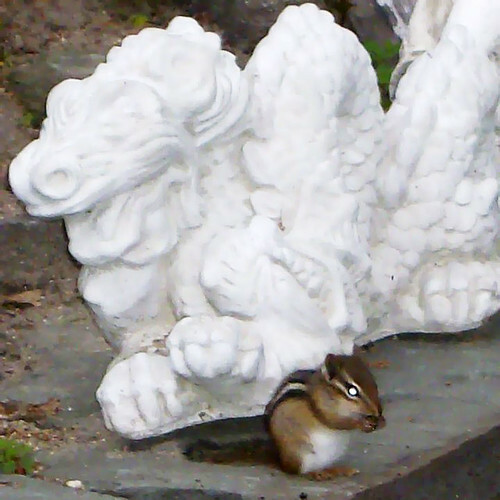 Th garden is over-run with cheeky chipmunks. They tear through my compost, dig up my plants, steal shells, make holes in the stone wall, and torment Little Nemo. Who need TV? He shows his true face in this one. The compost bins C.P. made for me out of our old deck wood. This entry was posted in In The Garden and tagged art, garden by Aria Nadii. Bookmark the permalink. 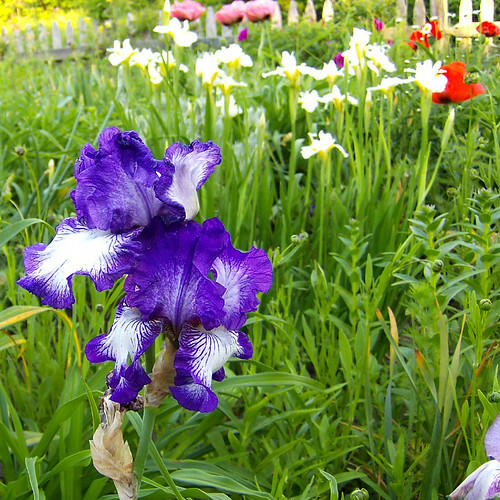 Your garden is always inspiring!! Thanks. 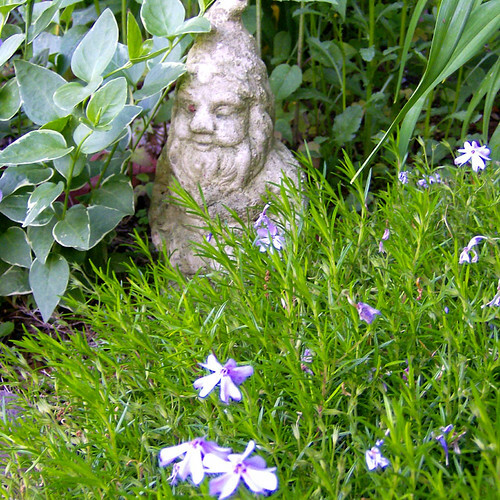 Gardening is how I meditate and get ideas. oh man, i love chipmunks. I grew up in Florida, where they only exist in fairy tales, and when I moved to Georgia and saw them I about flipped. They’re so tiny! They are pretty darn cute but also destructive. They get into everything and breed like crazy! They are smart too. Beautiful! And Happy Belated Birthday too! Love that strange bearded man on —goat legs?? Is that someone in particular? I think it’s a reproduction of a 19th C. (or earlier) style of statuary variably called drollery, chimera or grotesque. It’s quite amusing and weird. Thanks. I love that sculpture. C.P. found it for me. I think it’s a drollery. Gorgeous garden and Happy Birthday Lady!! Ha! I really like that first sculpture, too. The spiral garden looks very meditative. I love my spiral garden. I have always wanted to build one. Spiral garden envy! Always wanted one of those myself, but townhouse living isn’t conducive to that, so I make do with spiral rock designs. I used to do that in my Boston garden. The spiral garden is lovely! Thank you. We are collecting quartz stones for from the beach so it may take a while to finish it. It’s more fun that way. Happy birthday wishes – sorry I’m late to the party. Love your monstrosity and that cheeky chipmunk. And of course, your garden is so delightful. I think the chipmunks might steal them anyway. They steal anything and everything they can carry. Looking at your garden always makes me smile. Thanks. I love looking at gardens and pictures of gardens. amazing spiral path! 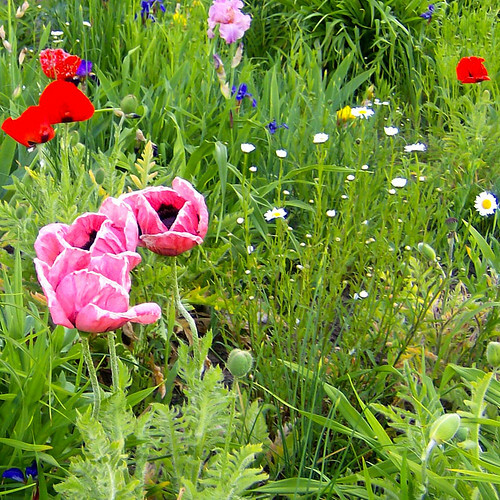 and poppies! I bought some seeds but not sure how well I’ll do with them. 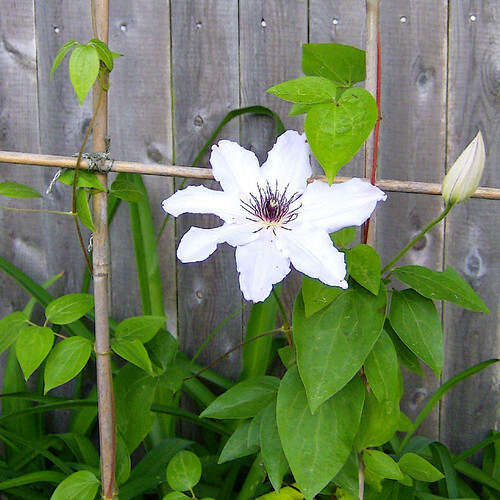 hope you had a great birthday…you really do create art in the garden. Thank you jen! I did have a lovely birthday. Poppies are easy but let me know if you have trouble with them. I’ll send you over some of mine. They are tough cookies and will grow anywhere. Once you get them going they should come back every year and spread themselves around. My nasturtiums are looking good but they haven’t bloomed yet so they didn’t get their pictures taken. Ahhhh, beautiful! 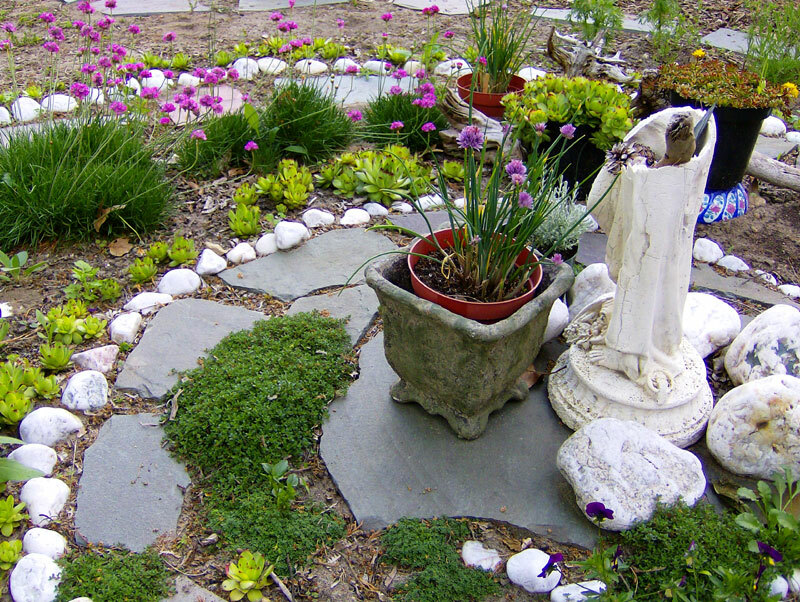 And I love the spiral garden idea. The ones that wish you would mow? If they move, let me know! If they move, I’ll do a little jig and let you know! Love love your spiral garden. Will you walk it like a labyrinth? I’ve always wanted one. Yes. I always walk the path. No cheating. I’ve always wanted one too. I’ve been thinking about making my own garden once I get a new place (whenever that might be). Are there any websites with instructions on how to construct one? I recommend it highly. Gardening is good for the spirit. You know. I don’t really go to gardening websites now that you mention it. There is one called gardenweb.com that has forums. I’m sure there is all kinds of recommendations and references there. Chipmunks….hehe. I do love to watch them at our birdfeeders stuffing those cheeks. They can always fit just one more sunflower seed in there, lol. And happy birthday fellow June baby! Hah. Potted Siamese. None of those here and it probably would not be a good idea to send them in the mail. You are Gemini. I should have guessed that. No. A Cancer. Much nicer than a Gemini. Heh. horray for your garden pics!!! So glad you like them. I like taking them. Happy belated birthday: I have a very belated sea monster package coming out to you sometime this week. Your space is amazing! Do the cats bother your kitchen nursery? One thing I have learned about gardening is the power of the sun. I know that should have been obvious, but when we bought this house I didn’t consider where the sun was the strongest, which is my front yard. My back yard is almost all shade. My next place will have a sunny backyard so that I can have a proper place to grow things! Happy birthday! Sorry for the late greeting though. Thanks. Yes. Nemo is a plant eater. He drives me bananas. Little scoundrel just ate the begonia that my mother brought me for a birthday present. He ate all of my pepper seedlings last year. A shade garden can be nice though. Awesome, as usual. I love what you and C.P. are doing. Spiral path! You know I don’t eat food! I can’t wait to get Dis to your house. He is going to love it every bit as much as I do. A flea beetle is an evil little bug that eats lots of holes in the leaves of plants. Not nice. We are infested with them this year. I have been spraying them with hot pepper and garlic oil but it’s a big garden. My second favorite slug control method is Diatomaceous Earth, the fossilized remains of diatoms, a type of hard-shelled algae. Sprinkle that around your plants or even lightly dust the leaves with it. They will not crawl over it. Helps deter ants too. 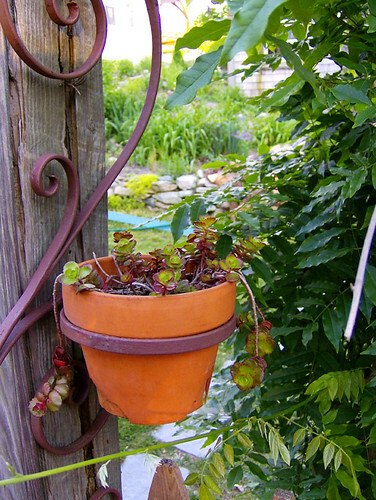 You can also use coffee grounds around the plants but not on the leaves. Other methods to control slugs are not watering your garden at night but you live in England so that probably will not work as well for you. Some people set out beer traps. Slugs like beer. They will drown in the trap though so I don’t like that method as well. I prefer to deter or remove most pests. Killing is a last resort, reserved for truly evil things…like flea beetles. Dis wants chickens. He can’t have chickens until I can have a goat! I don’t want to murder the slugs. I’ll have to give them other things to eat. Salt works on slugs but isn’t good for the plants or soil. Seaweed is fabulous for the garden. I use it as a mulch, fertilizer and in my compost. If it doesn’t deter slug it will at least do other good works. How about crushed eggshells. 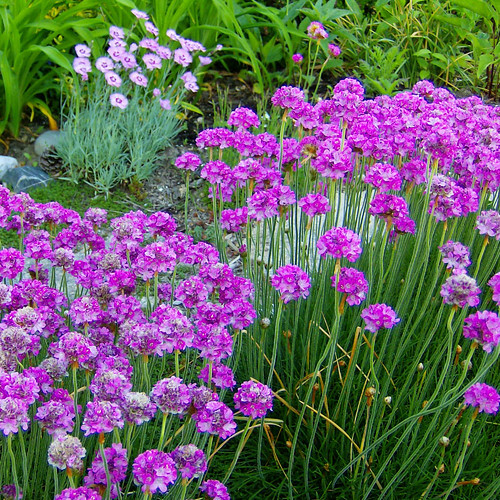 Grind them up in a mortar and pestle or a rolling pin and sprinkle it around the stem and lower leaves of your plants. It deters cutworms and other crawly things. It might work on slugs. Try circling each troubled plant with a small ring of eggshells and a larger ring of coffee grounds. Most coffee shops here will give you large bags of grounds for free if you ask them. Both coffee grounds and eggshells are good for the plants. 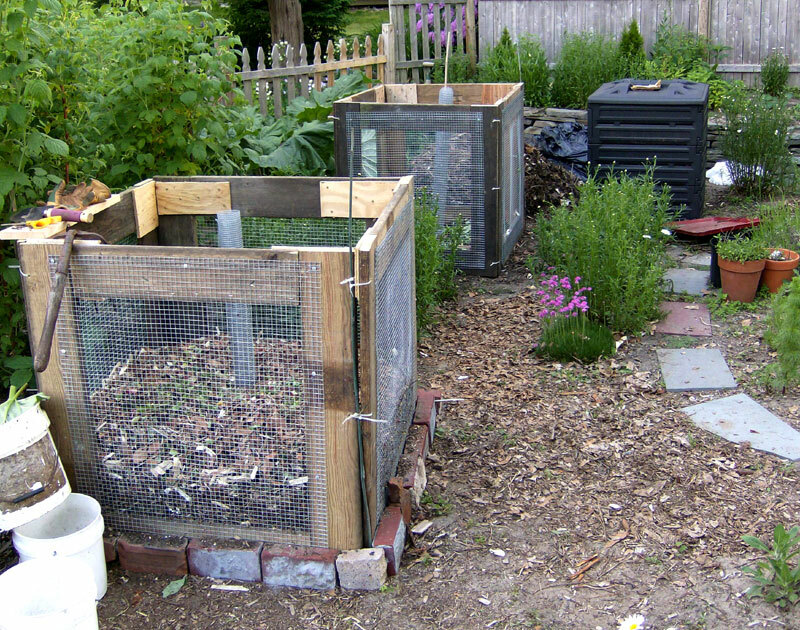 Do you have a compost set up? I find that having a compost bin takes care of a lot of pest problems. The pests bother the compost instead and do not attack my plants. The finished compost keeps the plants stronger and healthier and is a good mulch for the soil under them. This also deters pests like slugs and leaf eating insects. The healthier the plant and soil the less likely bugs will bother it. Another thing that I do is to plant one decoy plant per bed, something more attractive and vulnerable to insects that will make it less worth their trouble to attack my crops and perennials. Do reconsider your position on chickens. I know you want a goat but chickens are surprisingly appealing as pets and they are the all around best helpers for the garden. 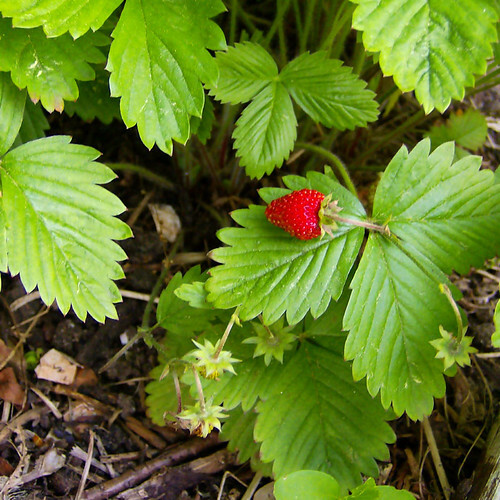 They make excellent compost and eat pests like slugs, snails, and beetles. Think of all those fresh eggs! No compost bin yet, that’s next on my list of things that need sorting out. I’m not sure where I’d put it, but I’m sure one will fit back there somewhere. I’m late commenting but wanted to chime in that the photos are gorgeous! I can see why you have been so busy, everything is so lovely. I can imagine tiny unseen creatures from the other-world frolicking in this playful place. I just took a chance and clicked on you and wow I’m glad I did. I love what you are into. To me Utopia would be living around only people that had gardens and thrived on them like you seem to! I just love that sculpture in the first photo, that strange mustached man face animal thing! I want one for my garden! That spiral garden is fabulous! I’m glad I went exploring and found your blog. Thank you for taking the time to explore and comment. I’m with you. That is my idea of Utopia. Most of the people around me are conspicuous consumers which sometimes borders more on Dystopia. My little garden gnome guy is there to spook the tourists and improve the vibe.